Reverend James Burns, IVD, Ph.D., was inaugurated as the 14th president of Saint Mary’s University of Minnesota in Winona on October 5, 2018. Burns is the first non-Brother to lead the school in almost a century. Burns, a St. Paul native, is returning to Minnesota after serving as the dean of the Woods College of Advancing Studies and summer session at Boston College. 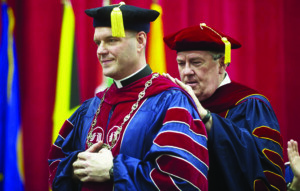 The theme of Burns’ inauguration address was “Saint Mary’s: A sign of faith, hope and knowledge,” in which he discussed the power of the university to shape students’ hearts and souls, not just their minds.